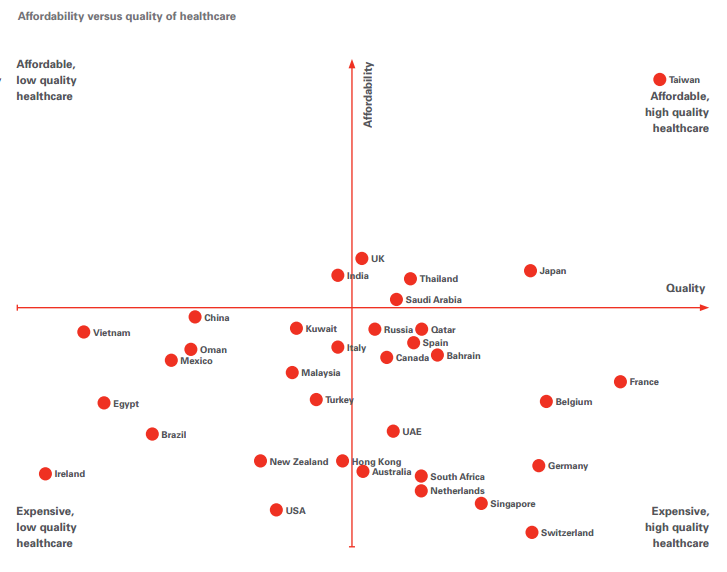 The 2014 HSBC Expat Explorer survey rates healthcare systems around the globe. The annual HSBC Expat Explorer survey has been released, and with it the ranking of 34 countries across three categories – expat economics, expat experience, and raising children abroad. Overall, Switzerland, Singapore, and China are the leading destinations for expats in 2014. We take at a look at the countries with the best healthcare systems for expats. Focussing on access, affordability, and quality. In terms of affordability and quality, expats rated Taiwanese healthcare as the best in the world. Taiwan was number one in the healthcare category, and third for organising healthcare. Nearly 70% of expats in Taiwan felt setting up their health insurance and other medical provisions was relatively easy, this compares with a global average of 55%. Expats also highlighted the affordability of health care in Taiwan, with over two-thirds (67%) saying they spent less on medical services than they did at home. This is significantly higher than the global average of 27%. The accessibility and quality of medical services in Taiwan were said by 64% to be much better than at home. Enduring expat favourite France, came second in the healthcare rankings. Nearly two-thirds (60%) of expats in France say they experience better healthcare than they did at home – much higher than the average of 38%. Over half (58%) cite high quality healthcare as a key advantage of moving to France. The health system isn’t the only positive aspect of moving to France, 48% of expats found their diet improved after they moved – compared with a global average of 34%. Just across the border from France, expats in Belgium find the health system to be high quality but not as affordable as at home. The number of expats who reported the health care costs in Belgium were higher than they were used to was 45%, higher than the global average of 42%. Germany’s health system came in fourth place with expats praising its high standards, but not the high prices. Over half (55%) of expats in Germany pay more for healthcare than they did at home. Germany was particularly popular for families with children, coming in third place in the raising Children Abroad league table. Nearly three-quarters (70%) of respondents said the health and well-being of their children had improved since moving to Germany, compared with the global average of 56%. Singapore was rated the second best country for expats overall and it comes in fifth place when looking at healthcare. As in the other countries in the top five, the quality of healthcare is high but so are the costs – 58% of expats pay more for healthcare in Singapore than they would at home. Expats are afforded good access to treatment though, with 48% saying they had little or no problems, compared with 38% globally. No matter where you’re moving to, the provision of healthcare should be something you organise sooner rather than later. Researching insurance options before you move will prevent surprises when you arrive. 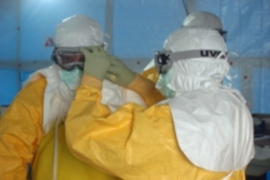 In many countries expats must have health insurance to get a work permit, in others they will be given the same access to healthcare as locals. Quality and standards vary considerably, and it doesn’t always follow that the quality in western Europe will be better than that found in Southeast Asia, for example. Ireland is at the bottom of the table with expats reporting expensive but low-quality healthcare. Taiwan’s combination of affordability and high standards makes it a clear winner and while the quality remains high throughout the top five entries, the price increases. This illustrates the necessity of a comprehensive international health insurance policy that covers you and your family abroad. 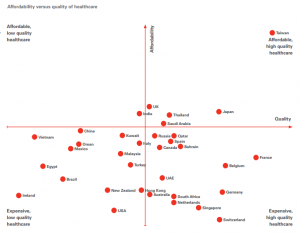 How does healthcare compare in top expat destinations?